they’ve been taught till they arrive at beliefs and practices that work for them; or c) indoctrinate the client in something new. Eastern Wisdom Western Soul is an example of the choice C. I liked the book, but I’m skeptical that it’s the right way to go. Singer, a therapist, has written the book as a way of illuminating Buddhist and Taoist teachings. Organized like a devotional, each chapter presents a nugget of wisdom from the ancient masters, followed by a meditation by Singer and a real life application. The book concludes with a reformulation of the Twelve Steps in Eastern terms. Shrinks have been intrigued by the teachings and meditation practices of the Eastern religions for many years. These teaching and practices have entered the therapy room in explicit ways, as exemplified by Singer’s book, and in much more subtle ways, where the spiritual and religious content is foundational, but seldom spoken of directly: yoga and meditation, for example, as well as the philosophical basis of Dialect Behavioral Therapy (DBT). The current love affair that the shrink world has with mindfulness is another example of the inexplicit influence Eastern teachings and practices have on the therapy hour. There is nothing at all wrong with importing whatever is good and works from other traditions and making them our own. Mindfulness, for instance, works. It has few ill side effects, and considering that life is short, paying attention to whatever is going on is probably what we should have been doing all along. But teaching something new is only option C; there are two more; let’s look at them. Ignoring spirituality is probably the option most frequently employed. Some therapists consider it as so much hocus-pocus, but not many. In my experience, shrinks tend to be deeply spiritual people, seekers who readily admit there is more than they know and eager to be the tool of an ineffable healing spirit. However even though shrinks are quite spiritual, they tend to be skittish about religion. Therapists who work in community settings get told that spirituality is outside their scope of practice; if they are not experts in theology, they should not be going all theological on their clients; if they are experts in theology, they weren’t hired as such. Furthermore, if they work in programs receiving public funds, they’re also told they must separate church and state and never, never tell anyone that they must convert, or pray this way or that, in order to treat their condition. These prohibitions only stop the most obvious forms of proselytizing to occur in the therapy room, while the more subtle means get through. AA gets a pass, as does DBT and mindfulness. I used to work in that kind of clinic, in a program where people who suffered from serious mental illnesses, such as schizophrenia and bipolar disorder, came and spent the day. Having them there so much, we were always looking for ways that would engage them. I decided not to ignore spirituality because therapy seemed empty without it. I began a spirituality group that anyone who was interested in the subject could attend. Even though my own faith is important to me, I was as skittish about religion as the next shrink; I tried to steer the conversation in this spirituality group away from God, the Bible, and all the other hot buttons that set people off. I thought Eastern thought and practices were safe, so I took a crash course in Buddhism and Taoism and tried to teach the clients meditation. There’s a good reason Buddhism and Taoism are so popular with shrinks. For one, they seem to offer a humane alternative to the reductive materialism of the Western medical model. They acknowledge the reality of suffering and offer a way to manage it. They are inwardly focused with a sophisticated sense of psychology. Finally, when effectively packaged for Western ears, they are free of the baggage that accompanies our home grown spiritual and religious practices. I soon found that all the people who attended my spirituality group had either been harmed by religion or were people who religion had failed to help. They were all Christian, but nobody wanted them in their churches, where they tended to disrupt things and repel parishioners. At worst, they had been told that they had a demon and were subject to exorcism; at best, they were told that they were beyond the help of prayer and urged to see a doctor. They were the shunned and the marginalized. My reasoning, in teaching them the basics of Eastern thought and practices, was to give them an alternative to the destructive messages they were getting from their home faiths. I have since learned, after working with native Buddhist and Taoist clients from Asia, that there is plenty about those systems that gets screwed up and damages people; but when Eastern wisdom enters a Western soul, it can be fresh and pure and uncorrupted. Singer’s book, which I am supposed to be reviewing, by the way, is like a cold glass of spring water. You will not find the xenophobia, judgmentality, and superstition you see when religion goes bad. If Eastern Wisdom Western Soul had been available when I was doing my spirituality group, it would have been our text. If I had the knowledge Singer does on the subject, I would’ve written it myself. In the end, I abandoned my idea of how to do spirituality group. My clients didn’t want to talk about any Eastern religious ideas and practices; they wanted to talk about their own. They needed to work through their own experiences, the things they had been told, and what they, themselves, believed. They selected option B; and I’m glad they did. So, what did we do? We did what the clients wanted to do. We read the Bible and talked about how they interpreted it. They looked in that deep pool and saw themselves reflected. In Genesis and the story of Saul and David, they found dysfunctional families like their own. In Exodus, they were freed from enslavement. The Prophets proclaimed their aspirations and the Psalmists, their desperations. When Jesus hung on the cross, they recalled their suffering, and Paul was the story of their recovery. I didn’t tell them what to think; I just got them talking. I would call the spirituality group very successful, even though it had not followed my plan. People kept coming to it for over twenty years; it was the most popular one in the program. The authorities never shut it down; it didn’t violate strictures against combining church and state because I was not imposing any religion on the clients, even one as non-threatening as Buddhism. Some highly psychotic people were able to talk about spiritual matters without getting overly weird. We listened to what they had to say, so they could turn down the volume, intensity, and drama. The group became a church, of sorts, for people who were not welcome anywhere else. Our only creed was respect; the only leader, me, was the one who least knew what he was doing. Option B, helping people work through what they’ve been taught till they arrive at beliefs and practices that work for them, ought to definitely be within a shrink’s scope of practice. Option B shouldn’t threaten anyone, including administrators and freedom-of-religion types. Option B also can include taking whatever is good and works from other traditions and making them your own. 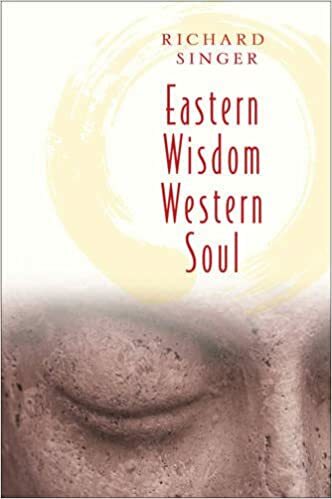 If you have a Western soul and are intrigued by Eastern wisdom, then I recommend Singer’s book. If you are a therapist for whom the therapy room seems empty without spirituality, then I recommend you quiet your thoughts, detach from the illusion of your ego, and listen.